During The Little Corporal’s first year, an engraving of Abraham Lincoln and his son, Tad, was offered as a premium to subscribers. The small mezzotint—page size was 6.5 inches high and 4.25 inches wide—was made from a Matthew Brady photo created in 1864. The engraved image is probably around the size of the original. Here, the President leafs through an album of Brady’s photos, as Tad looks on; it is the only contemporary image of Lincoln wearing his glasses. Such premiums were an inducement to subscribers to pay in advance. At a time when subscribers often received issues long after their subscriptions had run out, editors sometimes resorted to clever ploys in order to persuade subscribers to pay what they owed. This wasn’t the only premium the Corporal offered readers during its life: in 1866, a steel engraving of a section of a Raphael painting was offered; in 1870, P. Fisher Reed’s Reed’s Drawing Lessons was offered, as The Little Corporal’s Drawing Book. Editor Alfred Sewell advertised his premium in each issue the year it was available. Advertisements mentioning the engraving were supplemented by mention in editorial text and an account of how a subscriber framed the engraving. PUBLISHED AS A SUPPLEMENT TO THE LITTLE CORPORAL. A PAPER FOR BOYS AND GIRLS. THE LITTLE CORPORAL contains sixteen pages of first class literary matter. It is intended that it shall contain better original Stories, Poems, and other reading for children, and more matter for the price, than any other children’s paper on the continent. engraved in the highest style of the art expressly for a premium plate for this Paper,—which can be had no where else in this style. Every person who will send six subscribers, and six dollars, will receive as a premium, one extra copy for one year, and also a copy of the above Engraving. Every one sending ten subscribers, and ten dollars, will receive same as those sending six, and also of the “History of ‘Old Abe,’ the Live War Eagle,” the price of which is 50 cents. Every one sending fifty subscribers, and fifty dollars, will receive same as those sending ten, and also a fine Photographic Album worth ten dollars. Specimen number will be sent on receipt of ten cents. CARE OF DUNLOP, SEWELL & SPALDING, CHICAGO, ILL. The first No. (Dated July) will be issued in advance, June 3d, at the Great Sanitary Fair. The proceeds of all copies sold at the Fair will go into the Fair Treasury. 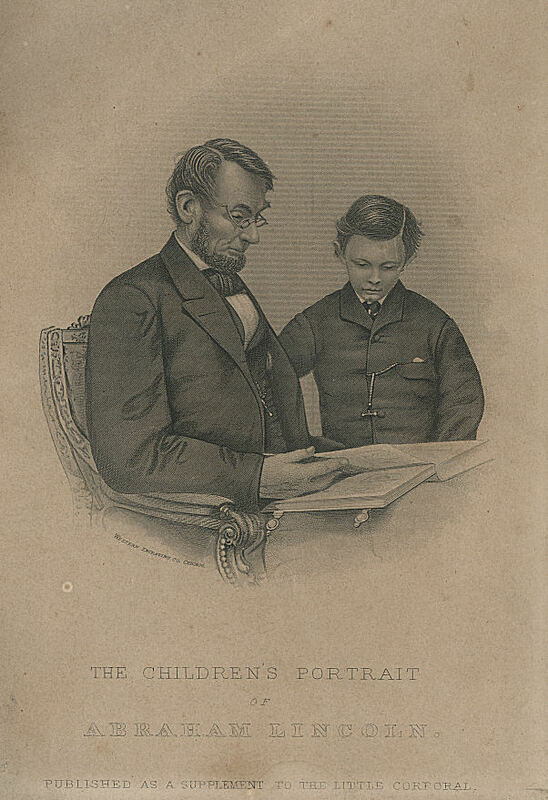 I do not sell “The Children’s Portrait of Mr. Lincoln.” I could sell a great many of them at a large price, as it is pronounced on all sides to be the neatest and most beautiful steel portrait of our martyred President and his son “Tad,” that has been published. I had it engraved at a high price expressly for a premium plate to The Little Corporal, and it can only be had by subscribing for our paper. I print this because many write to ask the price of the engraving by itself. Dear Little Corporal: I wish you were here in this study where I am writing, for I want to show you something. It is a minister’s study, and two of the walls are lined with books; but it is not to these that I want to direct your attention. No! nor even to the view, which, perhaps, would be as wonderful and beautiful to your eyes, accustomed to lake and prairie, as it is to ours, which gaze by day and night, in summer’s calm, or winter’s storm, and are never “satisfied with seeing" the great and wide sea, breaking with endless dash of white billows on the rocky promontory yonder. What I want to show you is the picture of our beloved Lincoln and his son which you sent me. I drew a wreath of olive leaves, and as we sat reading aloud together, as our custom is, my father carved this wreath in rosewood, and it forms the upper part of the frame in which he has placed my picture, which now hangs upon the wall opposite. I am sure you would say that the frame is beautiful. It was drawn and carved as a little token of love and respect to the memory of him whom we all loved so well.